Unlike the magical mythical fire-breathing dragons of legend, this fun-looking super fruit is very real. It is known as the diva of the fruit world and has become the latest ‘health hero’, not only as a health drink, but also as a vital ingredient in beauty products. The Dragon Fruit, also known as Pitaya, is one of the best super fruits on the planet. This vibrant green and red cactus fruit has an outer skin, which resembles the scales of a dragon. It is rich in minerals such as iron, calcium and phosphorus that our skin craves. Pitaya is also packed with Vitamins C, B1, B2 and B3 that make it a great topical treatment to moisturize and soothe reddened or sunburned skin. It is full of polysaccharides that help tighten skin and active-antioxidants to rid the skin of free radicals. Expanding their line of treatment-based products, BCL Spa has launched a brand new Pitaya Dragon Fruit skin firming treatment. The recent craze for Pitaya Dragon Fruit in juice and smoothies is the inspiration for BCL’s new sugar scrub, which looks and smells just like a fresh smoothie! Aside from the health benefits, it has beauty benefits too. Natural sugars are suspended in an exotic blend of certified organic oils that create a luxurious texture. Sugars work to exfoliate dead cells from the skin, while precious Argan, Olive, Jojoba and Spearmint oils leave skin feeling velvety soft and glowing. 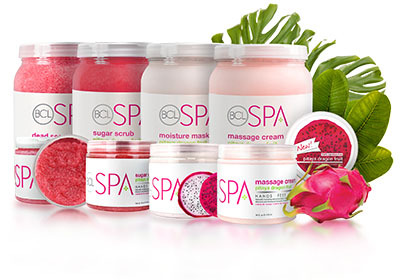 BCL Pitaya Dragon Fruit Skin Firming Treatment will launch in a four-step system: Dead Sea Salt Soak, Sugar Scrub, Moisture Mask and Massage Cream. Each step will be available in either a 16oz or 64oz size.